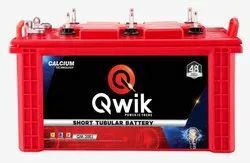 Manufacturer of a wide range of products which include short tubular battery qp1200-100ah, short tubular battery qp2200-190ah, short tubular battery qp1500-135ah, short tubular battery qp1800-150ah, short tubular battery qp1250-100ah and short tubular battery qp1300-120ah. Battery is the backbone of the inverter. Maintenance free batteries come in Flat plate collectors and are totally maintenance free. These batteries have a typical life of 4 years if properly charged and maintained.